and junky refrigerator magnets with molded plastique toucans on them. Seriously…are you kidding me? 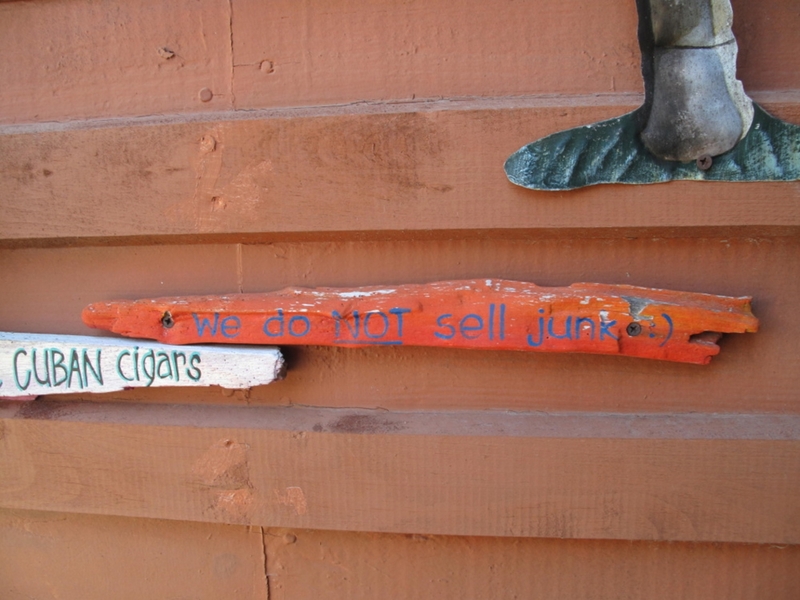 So…when I walk past a craft/gift store that has a sign like this? They are speaking directly to me. I must go in. 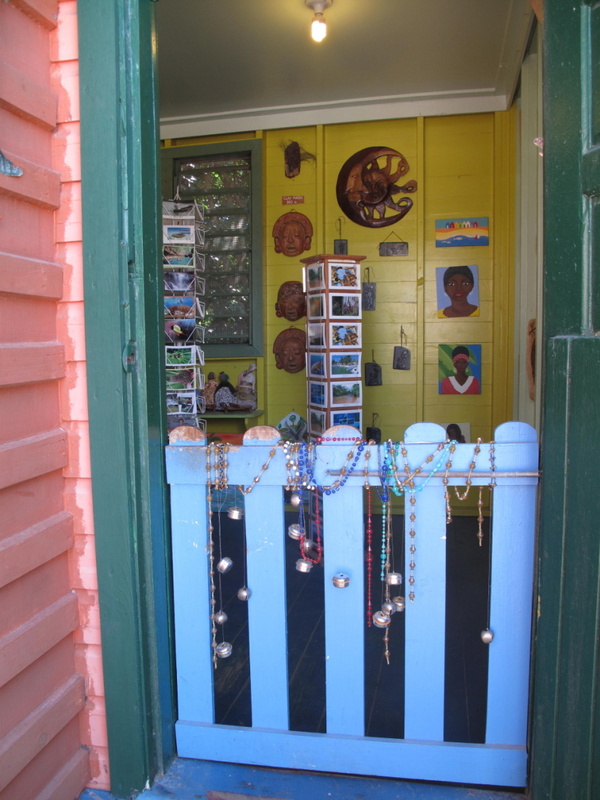 And the front picket gate covered in jingling beads and bells. Darling. 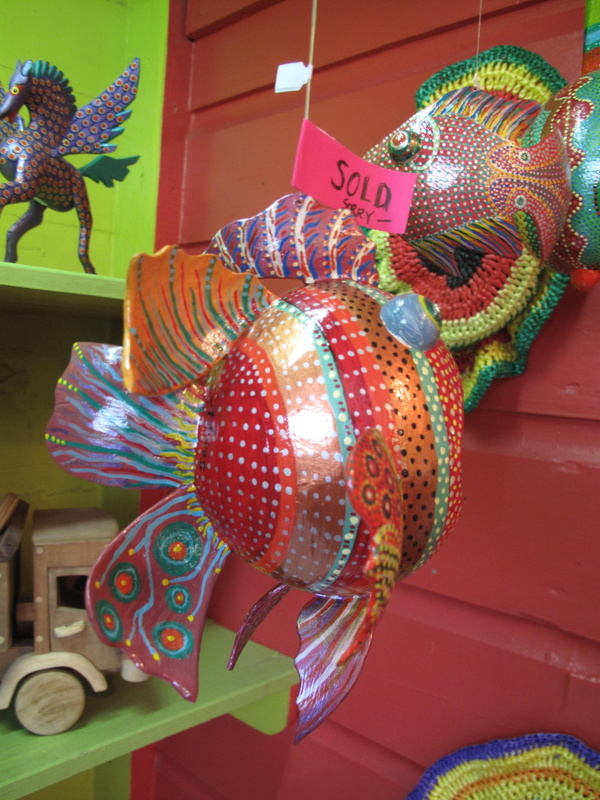 There is hand made pottery and paintings, very nice reasonably priced bags and jewelry and these fish…my absolute favorite souvenir in Placencia. 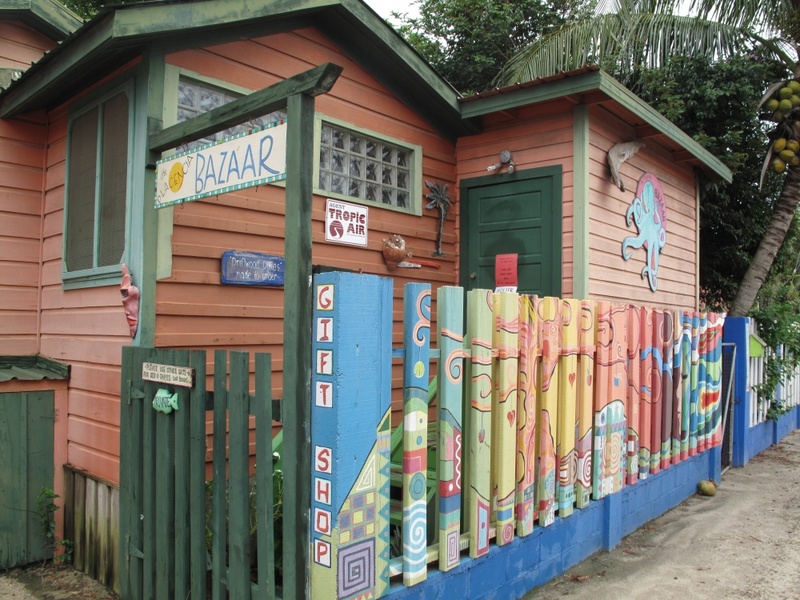 The owner’s husband makes these out of coconut shells, seals them and paints them by hand. They really could not be cuter. My pictures don’t do they justice but you will get the idea. Love. 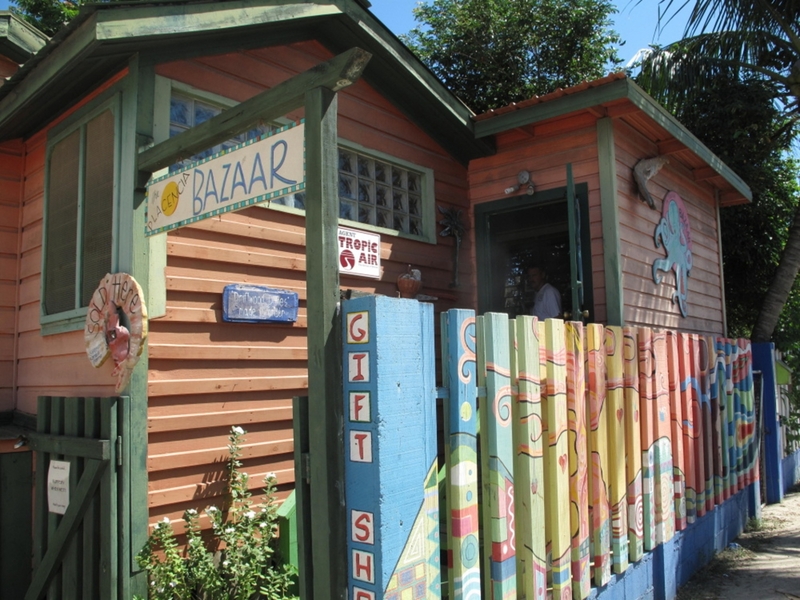 Stop by this little shop, The Placencia Bazaar, on the main/only road in Placencia Village. 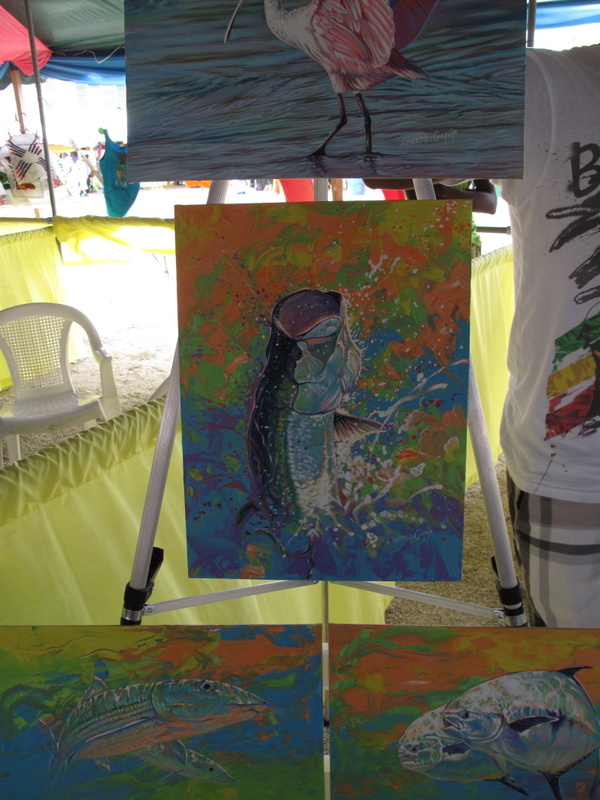 I then set out to find an artist who I had met at September’s 2013 Belize Market Expo. Ernest Garcia. 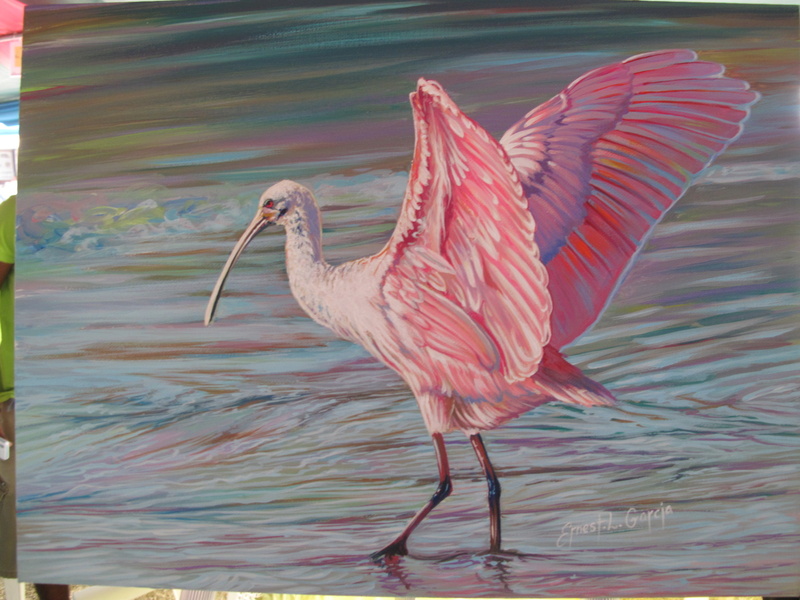 He does beautiful realistic painting with such cool colors…his new style is mixing in flourescents. 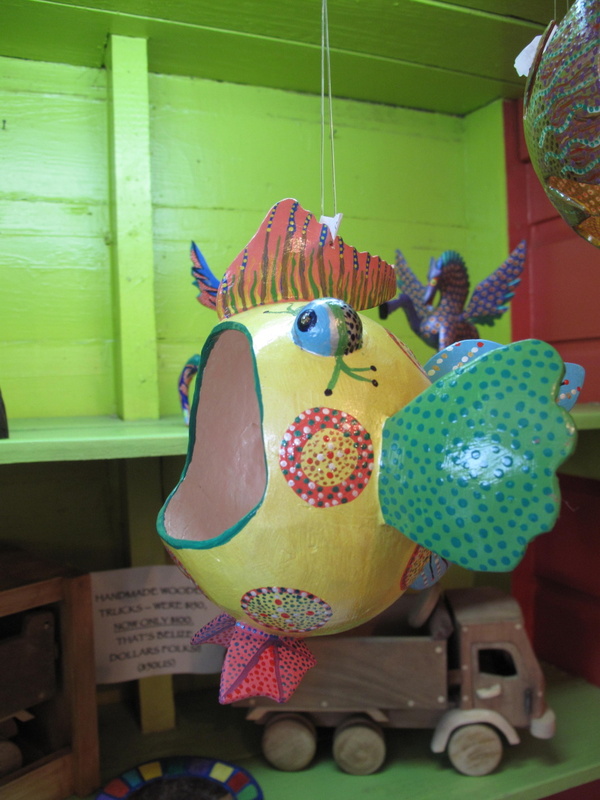 I found his work, though not the artiest, here at The Art Affair Gallery and I found lots more. Here are the paintings that I saw in September…why oh why did I not buy one for $150bzd (other than the fact that I am broke)? 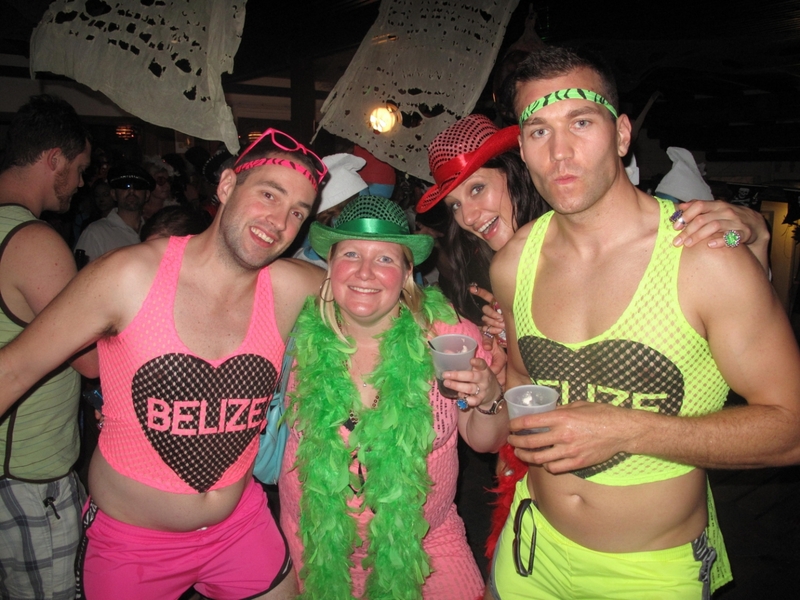 And this is the giant show stopper (on the left) in the shop in Placencia. I’m not even into fish but his paintings are beautiful. 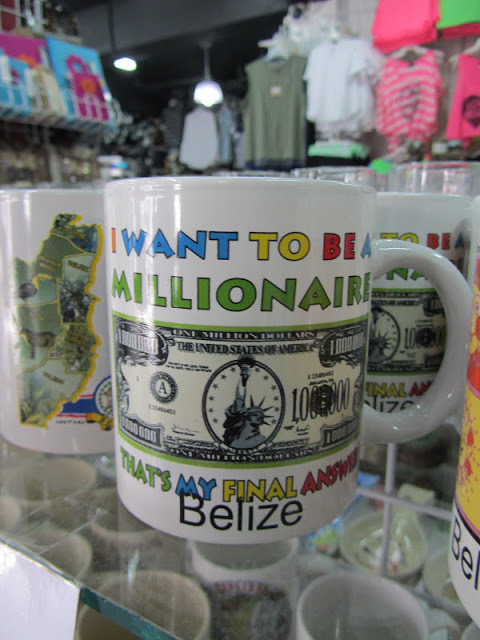 What a great gift for someone who comes down to Belize on a fishing adventure. 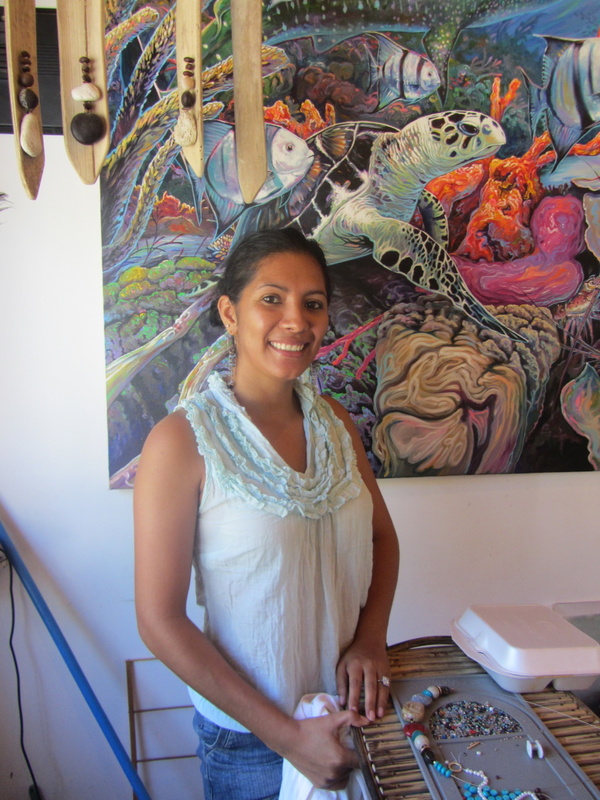 And the lovely owner of the shop, Jeanna. 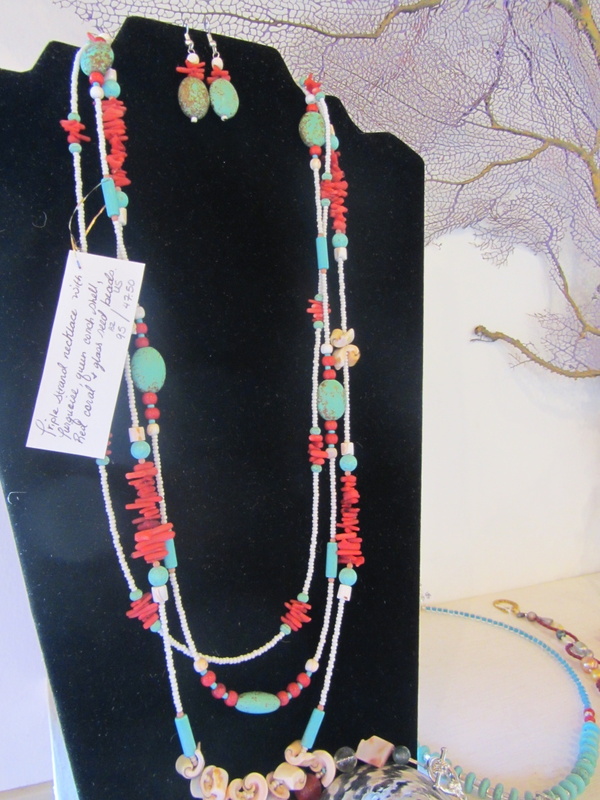 She makes some really beautiful and unique jewelry out of stones, glass beads and shells. 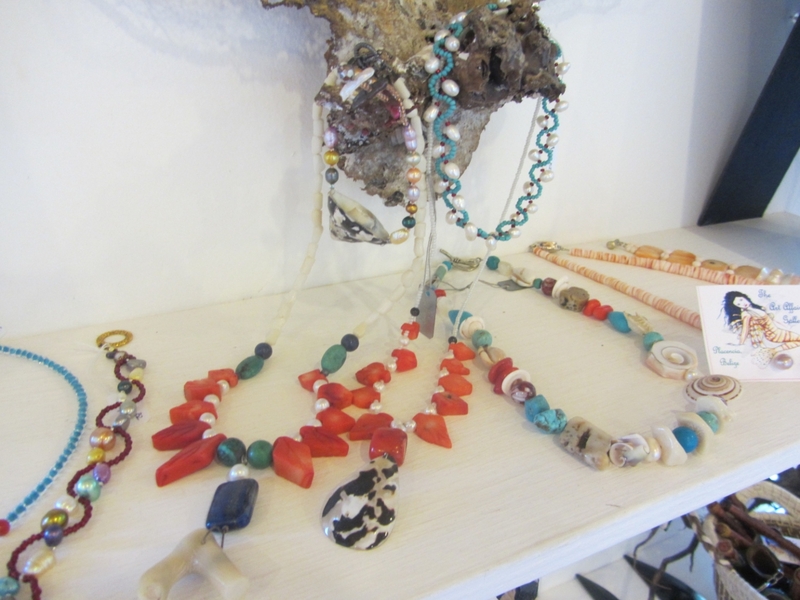 I chatted with her for a while and found that some of her collection is being sold in San Pedro. 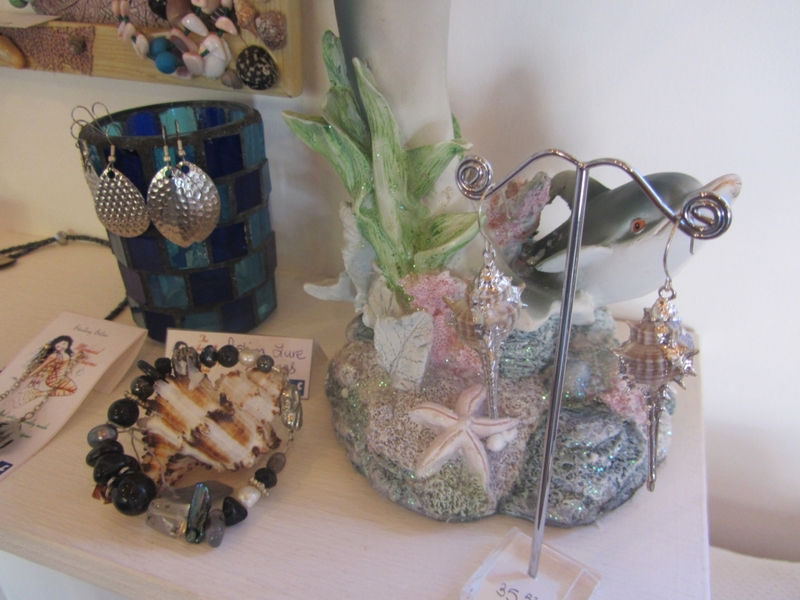 At RubiMoon Boutique on Front Street. Now what a happy coincidence. 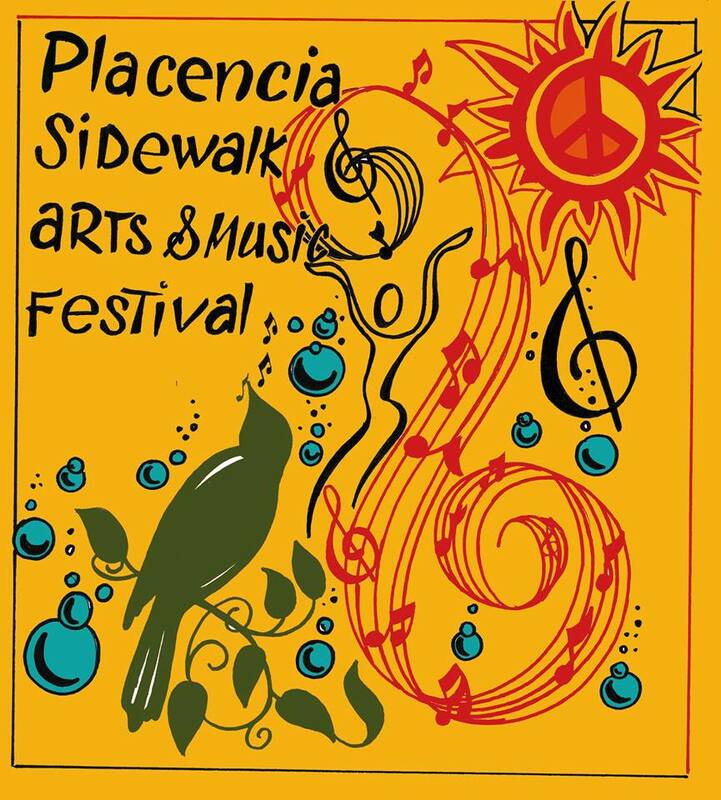 For more information, check the links below and, if you can, plan to be in Placencia on February 14th and 15th of 2014 for the annual Sidewalk Arts & Music Festival. And just an FYI, that Ernest Garcia painting would be the perfect valentine. New Things Around Town: Restaurants, Stores and NEW Micro-Brewed Beer! What nice shops you found! 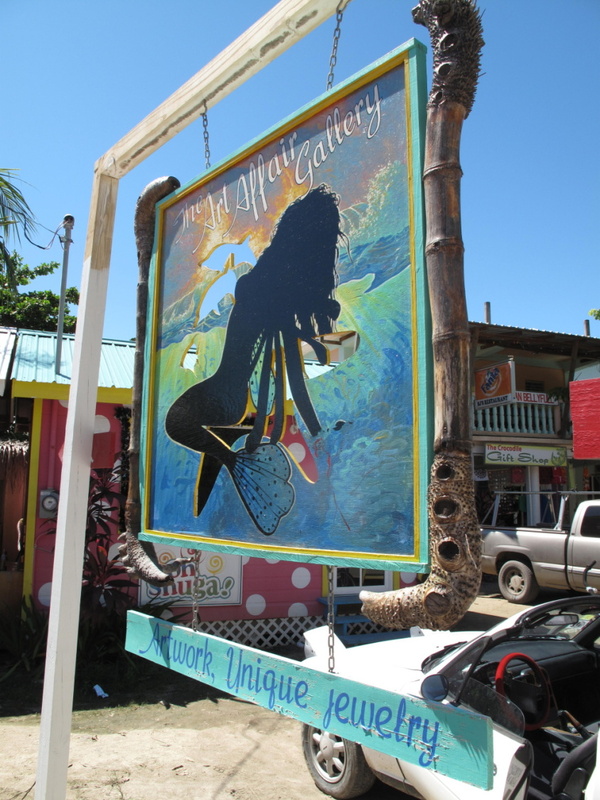 Seemed like both times we were in Placencia almost all the shops were closed — guess that’s because we went in the lowest of low season. I too hate the junky stuff. Good to see some quality stuff. 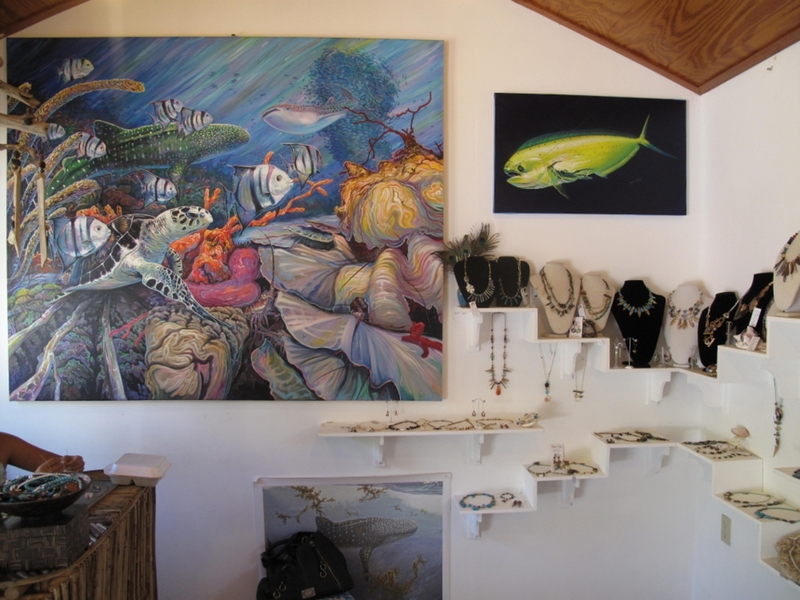 Love that jewelry, artwork, and especially the painted fish. Too cute!